Multiplayer shooters. You know them, you love them (maybe! ), and you play them (ditto). Resident Evil adds its own spin to the genre. Today at the Tokyo Game Show, I checked out Umbrella Corps. Announced this week, Resident Evil: Umbrella Corps. 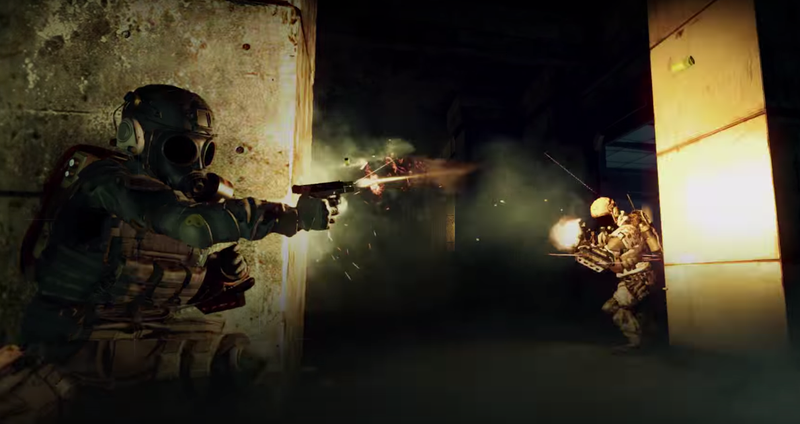 is a PS4 and PC close-quarters multiplayer shooter with zombies that stumble about. This is the franchise’s 20th anniversary title. It’s an odd choice. A very odd one. Because when you think of Resident Evil, you don’t think of multiplayer shooters. At least, I don’t. The demo was a three-on-three battle with each player given one life. That made matches short. Capcom hasn’t announced other gameplay modes yet, but yes, I’d imagine there will be a whole host of modes that are found on other multiplayer shooters. That’s the problem, though. There are already a bunch of other online shooters. There’s only one Resident Evil. So fans are left scratching their heads. The game is set in the Resident Evil universe, and the cramped map did work well to build tension and feel especially claustrophobic. Each player is equipped wiht a “zombie jammer” strapped to their backs, which enables them to slip past the walking dead undetected. You can also use zombies as shields. The zombies, as they sumble around, turn into obstacles and offer cover and create diversions. But! If opponents shoot or melee you, they can damage the zombie jammer, which means zombies can not only detect you, but will try to attack you. This adds an interesting twist to what would be a rather typical shooter. It didn’t feel gimmicky (though, it seems gimmicky as hell) and brings another layer of strategy and gameplay. In one instance, I waited on an upper level for opponents to either shoot them, throw grenades at them, or both. I took some damage while getting a kill, which wasn’t lethal, but it was enough to knock out my zombie jammer. The seemingly innocuous zombies that had been milling around upstairs with me saw me as something else: lunch. So, suddenly, I found myself fighting a horde of zombies, and bam, I felt like I was in a Resident Evil game—albeit, not that scary of one. But is this enough to convince players? Capcom probably hopes so. I liked the zombie element, and wished it leaned more on that instead of the online shooter element. Because, the iffier parts for me were the basic shooter stuff. Umbrella Corps. ran smoothly, and I didn’t notice any framerate issues, but the controllers just didn’t feel as solid as they should. They’re serviceable, but for this genre, serviceable isn’t enough. The compeition is too fierce. The game has to feel good. Perhaps, my impression is due to the way the game was shown: With only one life, when you die, you’re out of the game and left waiting for the match to finish. In the demo sessions I played, it’s harder to get a really good feel of the basic mechanics without the luxury of being able to respawn, try a bunch of things out, die, respawn again, and so on. Resident Evil: Umbrella Corps. is competing with a laundry list of multiplayer shooters, and the game really needs to convince players it does the basic shooter element at a high level. But the game won’t be out until early 2016, so there’s still time to fine tune.